DJ has brothers and sisters that play hockey, soccer and all kinds of sports. But DJ, who has autism, had difficulty finding a sport that he enjoyed. Instead he preferred to play video games and stay inside. His parents had heard about Fieldstone Farm and decided one day to give it a try. 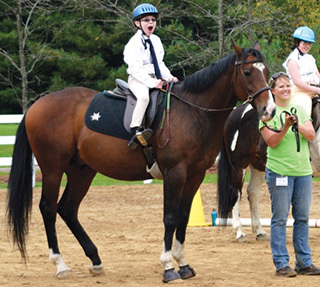 DJ loved horses and excelled at riding. One year he set his sites on winning a ribbon at our annual horse show. His delight and surprise could be seen on the faces of everyone as his jaw dropped when they announced his name as the winner. This pleasure could only be matched by the sense of pride on the faces of his parents, grandparents and instructor that day. For years DJ had watched his siblings win awards and that year he finally got one he could call his own. This is the kind of success that will have a lasting effect on DJ as he builds on this success and remembers the day he won a blue for years to come.